Written by Astleigh Mondegreen <[email protected]>. I think this may be some conflict with songbook. I had songbook installed and then installed lyrical and got this message when I tried to open a file. 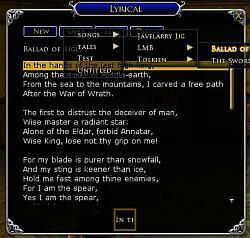 So, I uninstalled both, reinstalled lyrical first and then songbook and all seems to work ok now. Thanks for the great plug-in! 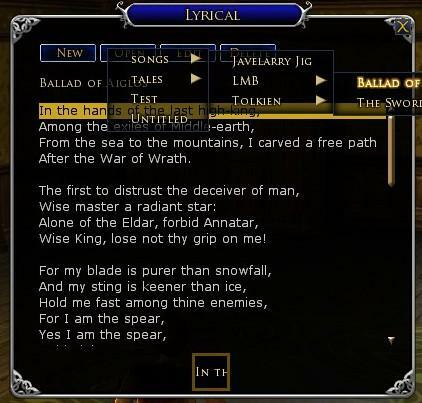 Music brings a whole new level to Lotro! Just wanted to say I was thrilled to find this plugin. Thank you. It sounds like you were using 1.5. I'm still not sure why it failed. I tested loading with version 1.5 savedata and experienced no problems. I honestly don't recall which version, though it was probably the one just prior. I updated my installation from last December, then after I had done that, I remember seeing a new update just a few days later and that was the current one. Edit: Hmm...I'm getting them confused. The current one is 2.2, so I would have updated to 2.1 from whatever was out in December. It would have been a new plugindata file, though, because I lost all of my old data in the reinstallation of the game and everything. Don't know if that's relevant or not. Last edited by Sorrieah : 07-19-2012 at 12:43 AM. Thanks for the bug report, Sorrieah. Its supposed to automatically convert the file format from older versions, but it sounds like you found a case where that didn't work. What version were you running before you upgraded to 2.1? tag to each file that was saved before folders were implemented. I didn't try it with an empty path name, just put Data as a dummy path. Now it's working just fine. Last edited by keli : 01-22-2012 at 11:57 AM. Good news! I finally found and fixed a bug preventing songs from saving, as some have reported. If you loaded other plugins at the same time as Lyrical, it could prevent the data from being saved. Upgrading to Lyrical 1.5 should fix the problem. Last edited by Astleigh : 01-17-2012 at 03:46 AM. Here's some additional info for those experiencing problems with save files not loading or not being regenerated. 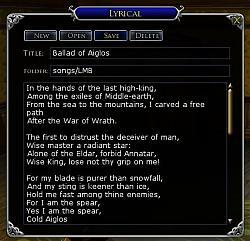 If you delete the old Lyrical.plugindata, Lyrical will regenerate a save file in the new format. The save data won't be written to disk until you either log out, or use the command "/plugins unload". This is a limitation of the plugin framework designed to sandbox plugins from the rest of the system. If you are still not seeing the save file being written after unloading your plugins, leave a comment. Hi Dwarrowlove, sorry to hear you are having problems. I've received comments from others who are having issues with save files, but I haven't been able to reproduce this bug. Any additional info you can provide will help. Are you using the latest version of lyrical? Do you use German or French locale? Untill one day it no longer saved my new files. Can you think of anything different you did that day? Such as, installing something new, upgraded client, upgraded lyrical, LOTRO crashed, etc. After you did this, is it regenerating the save file? Can you post it here? 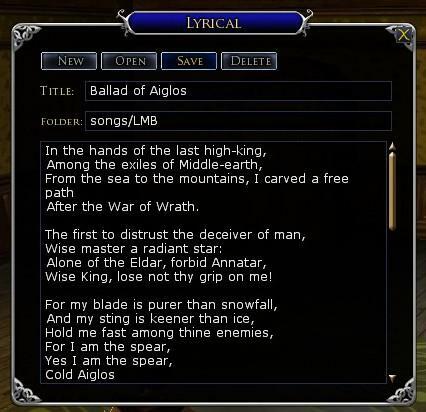 "Posting a note to let people know that Lyrical 1.4 should continue to work in Rise of Isengard." Not for me though, still same issue, tried everything listed here. As there is no support on this I will remove the application and try to find something else. It's a shame though, I liked the application when it worked. I have used Lyrical for a month or so, and all worked fine. I'm stuck with the standard note "Gil-galad was an elven king..." and can't add anything else. lyrical.plugindata won't reappear if I delete the earlier one, though I got around the other loading bug by adding the 'pages' variable manually to the file. I'm trying to understand the workings of the plugin, but can't see the logic at that spot. Update: got it to run after further editing the old .plugindata to include quotation marks around the array item indexers and turning them to integers, as suggested by Glenwin. Now it will also create a new .plugindata... strange. Last edited by Setharnas : 10-16-2011 at 05:55 AM.